A coin offered "IN HONOR OF ALL WHO HAVE SERVED, IN MEMORY OF ALL WHO HAVE FALLEN". 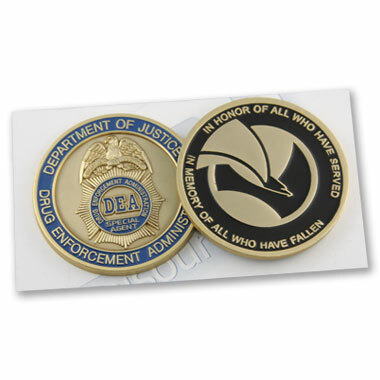 For each coin sold, a $5 donation will go to a special fund for the families of fallen DEA employees. 1.75" Diameter Die Struck Coin, Vintage Gold Finish.